Now that Summer’s finally here, I’ve been doing a lot of teaching, which I love. Even better, I am generally able to adjust my schedule so that I can teach dive classes during the week, giving me the chance to dive with people who come to Reno from all over the country. I had that opportunity on Thursday. This student is a professor at a major University, so he was a very interesting guy to talk to, even if we weren’t diving. His diving skills were pretty much flawless. Taking the PADI Altitude Specialty Diver course gave him the opportunity to learn the special considerations that must be taken into account when diving at altitudes above 1,000 feet, and get some great diving in at the same time. Diving at altitude is mostly an exercise in planning and discipline. Planning means knowing how to make adjustments for the reduced atmospheric pressure at higher elevations. The difference can be significant. 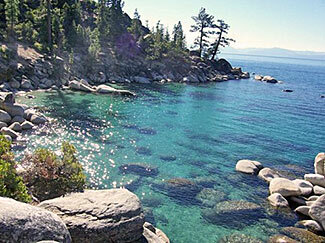 Lake Tahoe lies at 6,229 feet above seal level, with and ambient pressure of 11.87 psi, lake level. Rounded to 7,000 feet for the purpose of dive planning, a 70 foot dive at the lake is equivalent to a 91 foot dive in the ocean! There are some other things to think about too, like driving over mountains, thermal considerations, etc., but all in all it adds up to a great day of diving at the lake, and one more specialty certification for the diver. So, if you’re headed to the Reno/Tahoe area, give the shop a call (775.825.2147) and take along your gear (or rent it). You’ll see Lake Tahoe in a whole new way! This entry was posted in Dive Sites, Dive Travel, SCUBA Instruction and tagged lake tahoe diving, scuba, scuba instruction.